Artist, Educator, Therapist and Researcher. 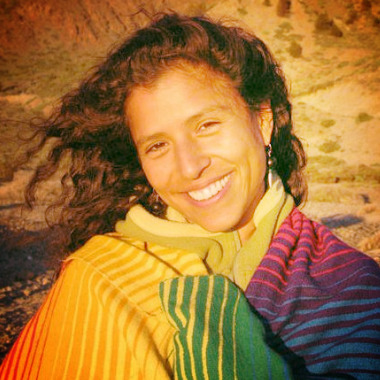 Claudia has been singing and dancing since birth, inspired by sound, the healing arts and the ability of the human spirit to overcome difficulty and transform it into new life, Claudia has been working with individuals and communities in Perú and the USA, fostering health through creativity, for the last 20 years. Claudia was born in Lima, Peru and studied music and movement since an early age. At age 18, she moved to California and entered the Music Program at Chico State University, graduating with degrees in Music and Education. Claudia moved to the Bay Area in California and studied with Anna and Daria Halprin at the Tamalpa Institute in Kentfield, CA. Claudia graduated from Tamalpa Institute as a Movement and Expressive Arts Therapy Educator. She continued her studies at the California Institute of Integral Studies in San Francisco, where she pursued a Masters in Psychology and Drama Therapy. She is currently finishing her Somatic Experiencing Practitioner estudies. While in San Francisco Claudia worked as a teacher and therapist. She loved working at Music Together, an organization that helps parents and children reclaim music and movement as natural avenues to joy and immersion in life, while strengthening a healthy parent-child connection. She also worked as a bilingual storyteller, sharing original indigenous stories to increase diversity awareness and tolerance. Teaching Artist, Youth Educator, Poet, Musician, and Event Organizer. Jahan Khalighi has been working with youth in the Bay Area for since 2006. He was a founding member of the Sprout Youth Arts Collective where he organized environmental arts festivals for and with young people. He served as an AmeriCorps member at San Pablo Elementary and was an Enrichment Coordinator for Making Waves summer camp, curating the arts and physical education activities. In 2010 he co-founded CommuniTree, an arts, ecology and social justice project that coordinated multi-day seasonal eco-arts and social action festivals across the Bay Area. As a teaching artist for California Poets in the schools he facilitates poetry and spoken word workshops for youth in the San Francisco, Oakland and Berkeley school districts. He is a published poet who has performed his original works at venues such as YBCA, La Pena, Esalen Institute, David Brower Center, Watershed Poetry Festival and Mission Cultural Arts Center. He is currently an organizing member of the Justice Arts Collective based out of Chabot College, a group of poets, musicians, dancers, and activists building community through the arts for social change. He is a lover of nature, community and the transformative power of the arts and creativity and is dedicated towards stewarding a healthier and more just world.